Two TV presenters attacked on Twitter by President Donald Trump have accused him of lying and suggested the White House tried to blackmail them. The hosts of MSNBC Morning Joe said they were warned a tabloid would run a negative story on them unless they said sorry for their coverage of Mr Trump. 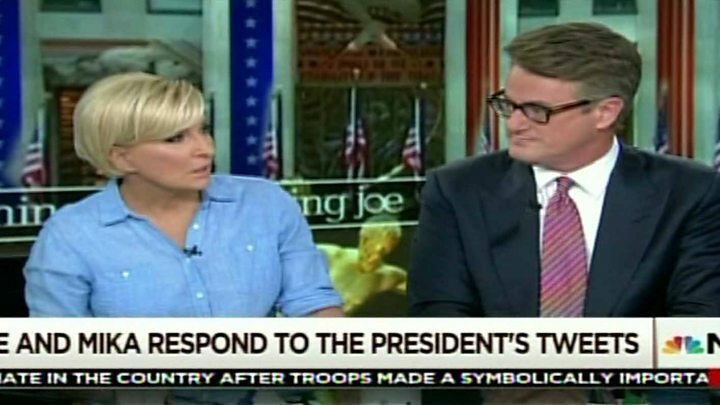 Mika Brzezinski and Joe Scarborough said Mr Trump's tweets were "vicious" and "frightening". The president called them "low IQ crazy Mika" and "Psycho Joe" on Thursday. He also referred to Ms Brzezinski as "bleeding badly from a facelift". The couple, who are engaged to be married, wrote a joint response in Friday's Washington Post accusing the president of an "unhealthy obsession" with them. What started yesterday as an undignified personal spat between Donald Trump and the hosts of a cable news show has morphed into something much more sinister - allegations of White House machinations that tread ever so close to outright blackmail. 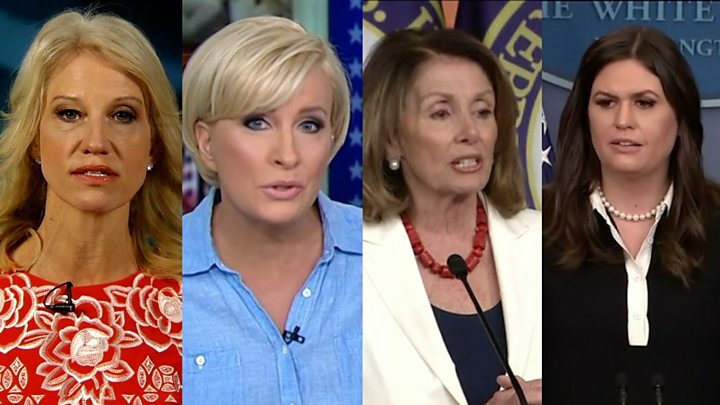 If what Mika Brzezinski and Joe Scarborough say is true, they were the targets of political dark arts reminiscent of the schemes of the Watergate "fixers" during the Nixon White House. Could Trump aides have really used the threat of an embarrassing story in a tabloid newspaper to pressure the two hosts to provide more favourable coverage? The Trump administration will surely deny the charges, although the president himself lent some corroboration by tweeting that Scarborough asked him to tell the National Enquirer to bury an article about him. That the president said he rejected such a request only raises more questions about the editorial control Mr Trump may have over a newspaper that routinely targeted his political opponents in 2016. Where this story goes from here is anyone's guess. Chances are, however, that the president - via his unchecked Twitter megaphone - will only add fuel to the fire. They denied his claims they had spent three nights at his Mar-a-Lago resort in Florida last New Year's Eve and that they had "insisted" on spending time with him. Instead they said they turned down his invitation to attend his festive party. They continued: "Putting aside Mr Trump's never-ending obsession with women's blood, Mika and her face were perfectly intact, as pictures from that night reveal." On their morning show, Ms Brzezinski denied having had a face-lift, saying she had a procedure to get the skin under her chin "tweaked". Does Trump's latest tweet storm matter? The TV presenters also said three White House officials had told them the National Enquirer would publish a negative article about them unless they apologised to Mr Trump for their scrutiny of him. Mr Scarborough said: "They said, 'if you call the president up and you apologise for your coverage then he'll pick up the phone and basically spike the story.'" "I had, I will just say, three people at the very top of the administration calling me." Ms Brzezinski said reporters from the supermarket tabloid began harassing her family. "They were calling my children," she said. "They were calling close friends. "These calls persisted for quite some time and then Joe had the conversations that he had with the White House where they said 'oh, this could go away'." David Pecker, chief executive of the Enquirer's parent company, is a staunch ally of Mr Trump, which is reflected in the tabloid's coverage of the president. But in a Friday morning tweet, Mr Trump denied the couple's claims, saying Mr Scarborough "called me to stop a National Enquirer article. I said no!" Mr Scarborough swiftly hit back: "Yet another lie. I have texts from your top aides and phone records. Also, those records show I haven't spoken with you in many months." Mr Scarborough also said that a "well-known congressman" had told him that the president went on a "rant" against the show during a meeting with around 20 legislators at the White House to discuss efforts to pass healthcare legislation. "I've been in politics my whole life. … He scared me," Mr Scarborough said, describing what the source had told him. "Because he was vicious when he turned from you to Mika," he described being told. "His face was red. He started talking about blood coming out of her ears, out of her eyes." The Enquirer's owner said on Friday morning the tabloid had published a story at the beginning of June about the couple's relationship "the truth of which is not in dispute". Dylan Howard, vice-president of the publication's parent company, added in the statement: "We have no knowledge of any discussions between the White House and Joe and Mika about our story, and absolutely no involvement in those discussions." The Enquirer's Twitter account retweeted their article on Friday, with a headline about "Morning Joe Couple's Sleazy Cheating Scandal!" Mr Trump's original tweet about the MSNBC hosts provoked a storm of criticism, including even from some fellow Republicans. Senator Lindsey Graham said Mr Trump's remarks on Thursday were "beneath the office" of president. "Please just stop. This isn't normal," tweeted fellow Republican Senator Ben Sasse. 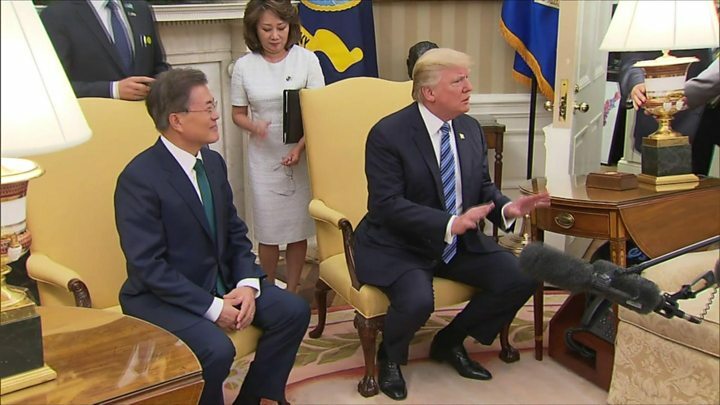 The Democratic leader in the House of Representatives, Nancy Pelosi, called Mr Trump's tweets "sexist, an assault on the freedom of the press & an insult to all women". The White House sprang to Mr Trump's defence. "I don't think that the president has ever been someone that gets attacked and doesn't push back," spokeswoman Sarah Huckabee Sanders told Fox News. In a previous spat with journalist Megyn Kelly, Mr Trump referred to "blood coming out of her wherever", implying her work was being affected by her menstrual cycle. The Morning Joe co-presenters have increasingly attacked President Trump since he took office. In recent weeks, Mr Scarborough has called him a "bumbling dope", while Ms Brzezinski has called him "phony", a "narcissist" and accused him of "destroying the country". Ms Brzezinski is the daughter of the late Zbigniew Brzezinski, who was President Jimmy Carter's national security adviser, while Mr Scarborough is a former Republican congressman. Does President Trump's latest tweet storm matter?